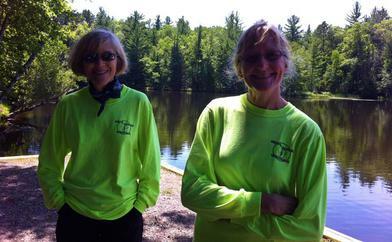 Saturday July 20/July 27: Welcome to Northwoods! Tune-up ride on quiet back roads in afternoon for early arrivals; departs between 1 & 3PM. Take along snacks provided. Emergency support available upon request. Enjoy a perfect start to your bicycling vacation by getting reaquainted with old friends or making new ones. 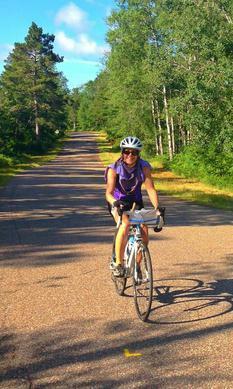 Preview some of the Northwoods scenic back roads with an afternoon tune-up ride. Supplement the ice cream buffet with goodies fresh from the ovens of bakery 101 as you keep one ear tuned to the route brief of the week ahead. Enjoy your stay at Quality Inn of Rhinelander with indoor pool, whirlpool, and workout room, plus a great spot for our Happy Hours. Today we blend some of past Northwoods routes with some of the new. 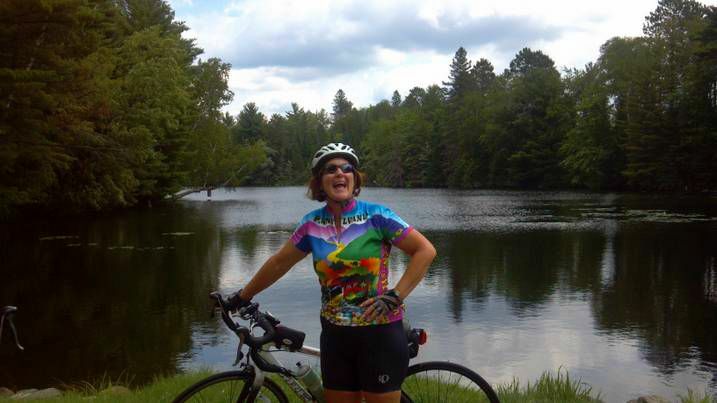 The result is a great ride through the heart of the timberland and lakes region over low traffic roads. There are options to adjust miles for whatever your desire and all routes lead back to PAW Happy Hour with dinner to follow at nearby Holiday Acres Resort. 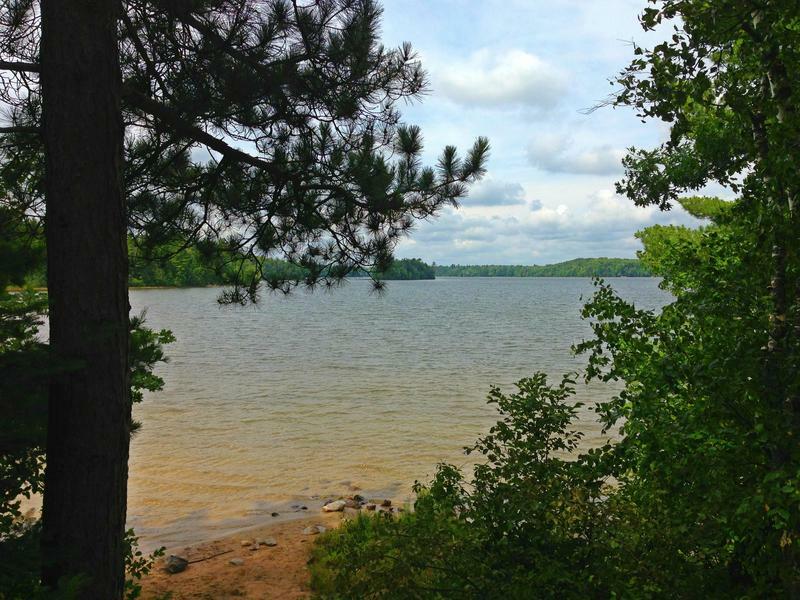 Fantastic food stop planned at Perch Lake, where you can relax by the lake and spot native fish in the clear Northwoods waters. Happy Hour at Days Inn! We wind our way North through the woods and between the lakes into a never-never land where the deer feed on chocolate plants and cyclists always have a tailwind. Of course we have a destination....who among us could have guessed we will soon be in Three Lakes and cruising North on CO. RD. X to the landmark boat lift? Then it's on to Eagle River where a very nice property acquired by Days Inn will be our home until our return to Rhinelander. While in Eagle River we will have two dinners at Riverstone, known to be the finest in the area, and opportunities to explore nearby restaurants and watering holes on our own. Supported loop rides and Happy Hours are on the schedule on layover days. Yet another photo-op loop through bicycle heaven that you won't want to miss. While there is always an opportunity to cut your miles, we predict that on a day like this you won't want to turn back. The food stop on the lake is an ideal half way point for 40 milers or a great place to gather a bit more energy to go all the way to Boulder Junction for lunch. Eventually, thoughts of dinner again at Riverstone will bend your handlebars to the Southeast. But be warned, the last time we used this route ten people mailed in their job resignations from the Boulder Junction Post Office. And ten more called grandchildren to tell them they were sorry, but they would not be coming home for awhile. Several more made stops at real estate offices. You got it......this ain't Kansas, Dorothy. This is one of the most scenic loops of the week; newly arranged so everyone can see Nicolet Forest without riding more miles than they would care to. The beach in the forest makes a perfect destination no matter which route you take. The stone shelter with dual fireplaces and the sand beach must have been put there just for PAW riders to have lunch. This must be bicycle heaven and your Tour Director sees problems ahead getting people to head back to Eagle River. Perhaps a recruitment of cycletroopers to find & fetch Bubha to set up happy hour will coax us back. Dinner at Riverstone-----could we stay away any longer? 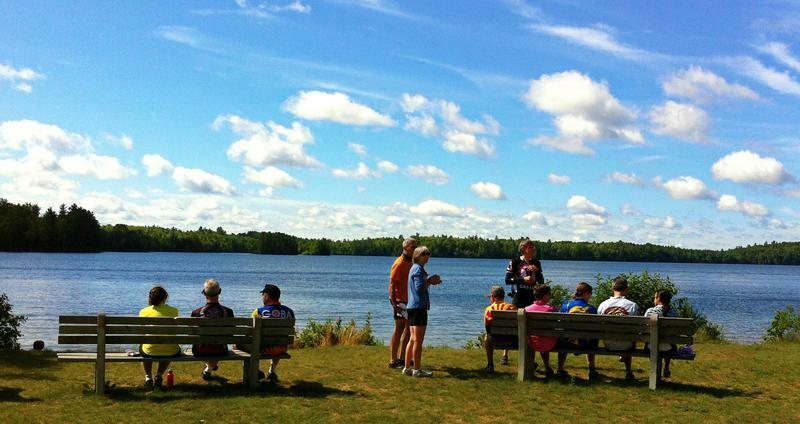 Swim, sleep, shop, canoe, or cycle through beautiful Northwoods country. Click your derailleur three times. Yes, Dorothy, this must be bicycle heaven!! Those who ride will be rewarded with a day to remember. There's bound to be Eagles soaring above the food stop on the lake, where we discover the source of the Wisconsin River. Crossing the Michigan state line we head for Land 'O Lakes in search of better butter, but settle for a little used blacktop bike path tucked away in the woods. Our route takes us past lakes called home by loons and a rustic store in the woods called home by ice cream lovers. Thoughts of PAW happy hour propel us south to Eagle River. 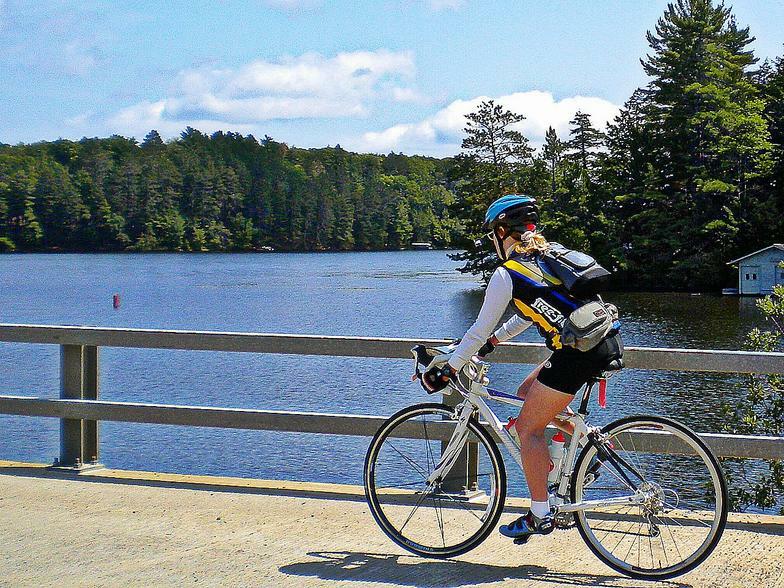 The ride to Lake Tomahawk is the perfect blend of lakes and woods with a chance to see Eagles soaring and vast expanses of lakes. St. Germain claims to be surrounded by 1300 lakes, nearly the same as the number of its residents. People come here to fish, an activity we support since it keeps them off the roads. 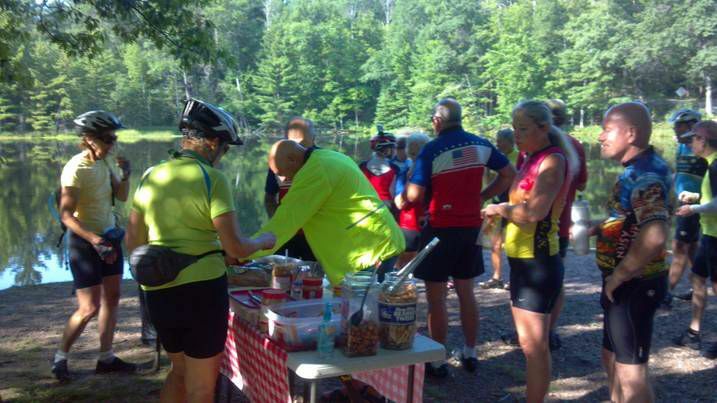 The PAW food stop in the Lake Tomahawk shelter will certainly give you enough energy to make it to St. Germain where you can be sure our route weaves its way between the many lakes and takes in Four Corners road where over two decades ago riders observed a short message on the pavement. It said simply: "BICYCLE HEAVEN." And it still is. The week may come to an end, but remember, PAW rides never end as they go on forever in our memories. Your car (frown) and end of the ride and snacks (smile) await you in Rhinelander. The sign-up line for next years trip forms to the right. Note: Exact miles and routes depend on road conditions plus the opening of any new bakery or ice cream shop and how far out of the way it is. Itinerary including dinners may take place on other days. *Pedal Across Wisconsin is an equal opportunity provider. 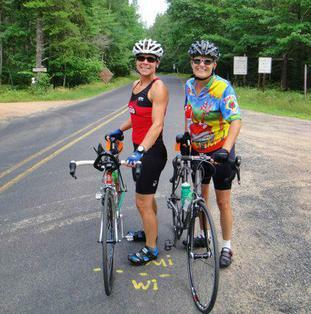 Pedal Across Wisconsin utilizes National Forest Land under the terms of a special use permit with Chequamegon-Nicolet National Forest. Great place to relax and watch for Eagles at our food-stop--Star Lake. Fantastic view heading into Eagle River!